Tiger Woods and Greg Norman have never particularly seen eye to eye, and the story was little different when the 2019 United States Presidents Cup captain was quizzed about the Australian legend this week. 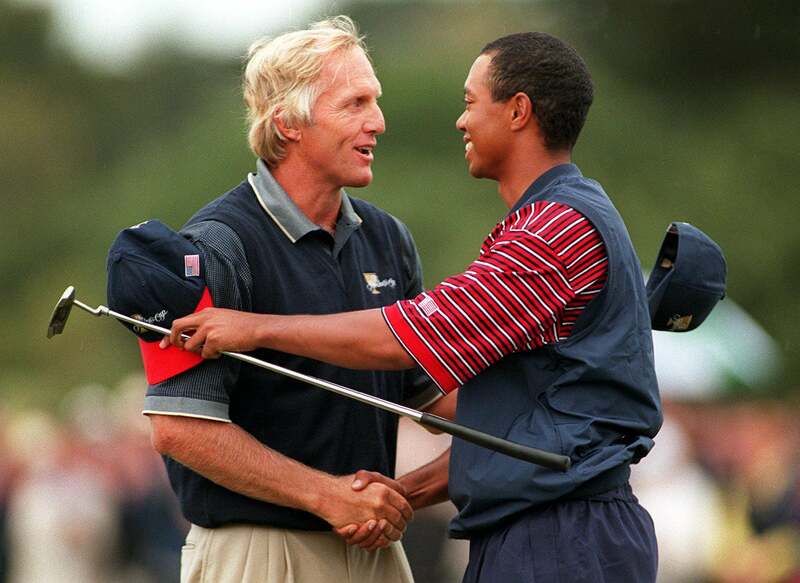 Woods, who has visions of becoming a playing captain at the Presidents Cup when the Americans battle Ernie Els' International side at the end of next year at Royal Melbourne, was asked by the media about the time he beat Norman in the Sunday singles at the same venue in 1998. The Internationals may have gone on to record their sole outright victory in the biennial event's history two decades ago, romping away with a commanding 20.5-11.5 victory, but Woods recalls the satisfaction he took from taking down the man who had dominated the top spot of the Official World Ranking previously. RELATED: BUBBA WATSON TELLS TIGER WOODS "I'D RATHER BE A VICE-CAPTAIN THAN A PLAYER"
"I did," Woods responded to a journalist's question about beating Norman ahead of promoting the 2019 Presidents Cup this week. "That was fun." "I wanted to play against him. Jack [Nickalus] and Peter [Thomson] had talked about what kind of pairings would be great for the tournament. "We were getting blown out, and so that was one of the key match-ups that I felt like I could handle and I could play, and I felt like I could earn a point for our US side." Woods also got the better of Norman again when the Australian was captain of the Internationals at Royal Melbourne in 2011, when securing the cup-winning point during the United States' 19-15 victory. The 14-time major champion's comments come off the back of a number of Norman's niggles of Woods this season. Back in February, the Great White Shark explained how golf doesn't need Woods back inside the ropes, before going on to say 'I'd hate to see golf get lost again in all the Tiger talk' in October. The United States have won the Presidents Cup 10 times, including the last seven, with the Internationals only recording a victory in 1998 and tying in 2003.